The current Prospect Point Lighthouse was built in 1948. In 1888, just off this point, the historic steamship S.S. Beaver ran aground. This accident followed years of shipping mishaps caused by rocks and strong tidal currents. Even so, eleven years passed before the original Prospect Point Lighthouse was constructed - a wooden building equiped with a lantern and fog bell. The lighthouse keeper, John Grove, lit the latern at sunset and extinguished it at sunrise. Grove also ecorded inbound traffic, cleaned the lights and fog signals, rewound weights for the fog alarms every half-hour, and ran the signal station atop Prospect Pint. The existing lighthouse was converted to electricity in 1926. Vigorous tidal currents benefit sea urchins, rockfis, parchment tubeworms and the Pacific giant octopus - the largest octopus species in the world. 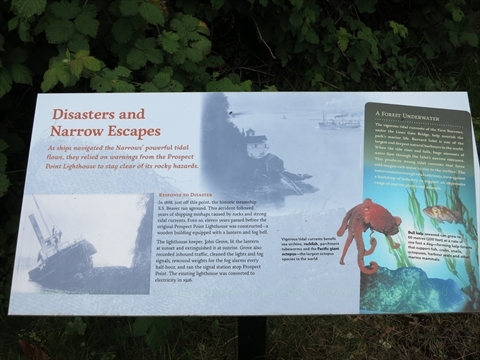 The vigorous tidal currents of the First Narrows, under the Lions Gate Bridge, help nourish the park's marine life. Burrard Inlet is one of the largest and deepest natural harbours in the world. When the tide rises and falls, huge amounts of water flow through the Inlet's narrow entrance. This produces strong tidal currents that force cold oxygen-rich water to rise to the surface. The water contains enough vital nutrients, even against a backdrop of industry, to support an impressive range of marine plants and animals. Bull kelp seaweed can grow to 60 metres (200 feet) at a rate of one foot a day - forming kelp forests that support fish, crabs, snails, octopuses, harbour seals and other marine mammals. 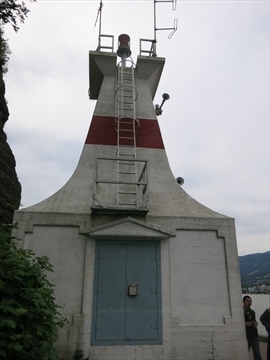 Where is the Prospect Point Lighthouse in Stanley Park? The Prospect Point Lighthouse is located on the Stanley Park Seawall between the 4.5 km and 5.0 km markers. It is almost right under the Lions Gate Bridge.